One of the things that the judge program was able to give me, is the opportunity to travel abroad to judge international MTG events. 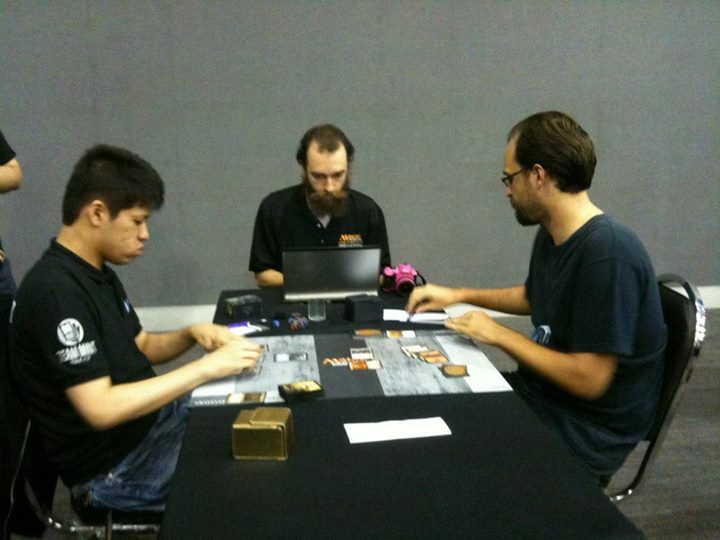 GP Bangkok 2013, which was held recently, is one of those places I was able to visit and I got the opportunity to see how Magic is played there. The format of the Grand Prix was Return to Ravnica block sealed deck, with day 2 running Return to Ravnica block booster draft (for those fortunate people that were able to make it to day 2). We had Friday public events, in which players can get the chance to win 3 byes (and some boosters) in a Return to Ravnica block sealed deck, single elimination tournaments. Since I was granted room sponsorship by the organizer, I am to work for the Friday events (it’s mandatory for those who gets sponsorship). As we were waiting for the tasks that are to given to us for the day, I approached my team leader, Wearn Chong for things that we should do. I asked him to be included to the deck check team, as my assigned task for the next day will be on that same team. He gladly gave me the position, but not to which I’m expecting to do: he gave me the position of TEAM LEADER of the deck check team. At first, I was surprised. The role of team leader was something new to me, and I haven’t done it properly so far. But nonetheless, it’s a big challenge for me and probably this kind of opportunity will never be granted this easy in the future. I agreed to be team leader, and Wearn asked me to get 3 more people to be with me. I had my mentor Loco to be with me, and my good Korean friend Woosuk as well. I also asked for Alex, which will be on the same team with me for the next day (as it will be good practice for us to do so). I learned a lot of things from Loco during this endeavor. Some of the things that a leader should know is when we should take breaks (and take as much as we don’t want to tire out easily). Also, a leader must be always taking initiatives, as when the leader falls down, so does the team. There are a lot of things that I didn’t mentioned, but probably I will get back to it. The day ended with the rest of the Friday team registering sealed pools for the preregistered players for the next day. Say, did you know that preregistering pools is quite fun to do? You get to open packs… a lot of packs! So the first day of the event was this packed. Not much though, as we had 867 players here (opposed to the 4500 players in Las Vegas, running on the same weekend as we are!). And here’s our judge photo! The guy in red is the head judge, Riccardo Tessitori (level 5 from Italy). Just a feature match… featuring Yuuya Watanabe and Mat Marr. The guy in the middle is our event coverage guy, Pip Foweraker! As I said earlier, my task for the main event day 1 is on deck check team. So how does a deck check team work on big events like this? Simple. We count ALL of the deck lists, look for errors, arrange them in order, and hand out penalties to those with errors. 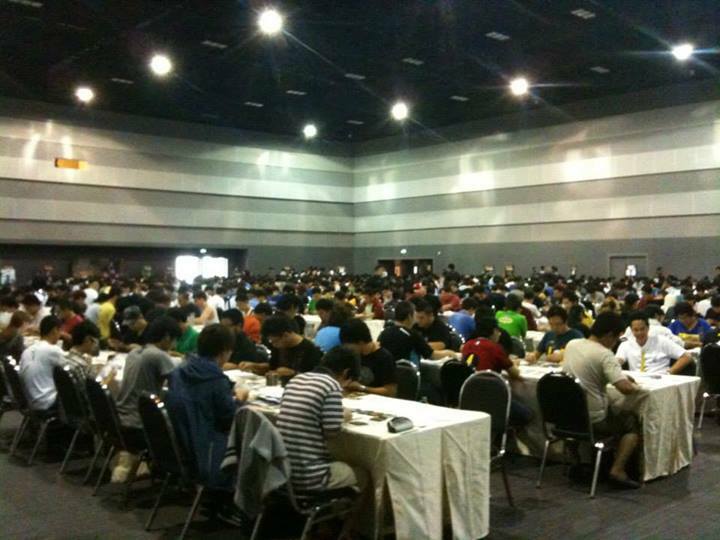 As different teams are doing their own jobs (paper team handing match slips and posting pairings, logistics team doing much of the physical labor, and floor team watching matches), our job is to make sure that we meet the recommended number of decks check throughout the event (with 10%, I believe, of the total number of players). One of our challenges during the event is to sort the deck lists. It took us 2 rounds (at least 2 hours) to count and sort, so we had to do random deck checks on round 3. That’s a bit late if you ask me. Even with a team of 7 people, there’s no way we’ll be able to meet the required number of decks to be checked (at least on how I see it). Luckily, Riccardo had a plan to compensate for lost time. His plan was to check the top 50 players starting on round 7, get their deck lists, go to the table, ask the players (while playing) to see their decks. If they want to draw a card, we can give them the card (of course, it has to be in the same order, we can’t randomize the deck whatsoever). Then we’ll quick scan the deck for rares, good uncommons and commons. Then check against their deck lists (without them noticing) if the actual count is correct. If there’s no discrepancy, then their deck is good. It won’t take 3 minutes for one player, so the process is kinda quick. Of course, you can only do this in sealed events like this. I don’t think this will be ever applicable in constructed events. I imagine the nightmares doing it there. At the end of the day, we were treated to a judge dinner! 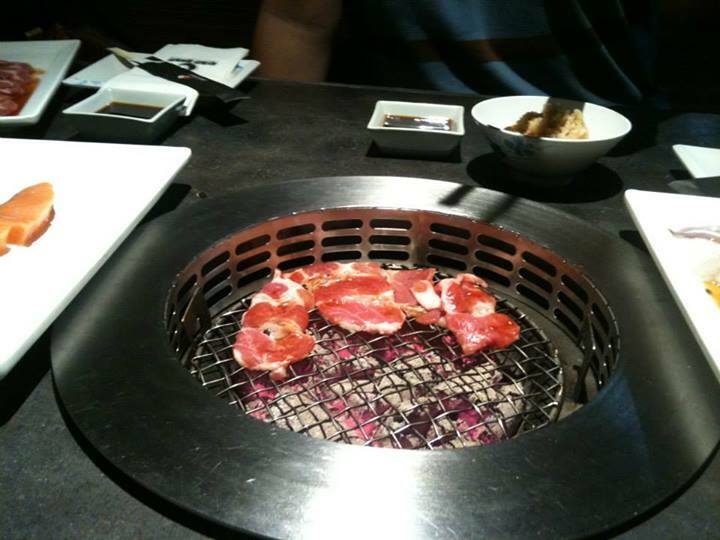 It’s Japanese Yakiniku, everything’s unlimited (except for beer, which you have to pay). 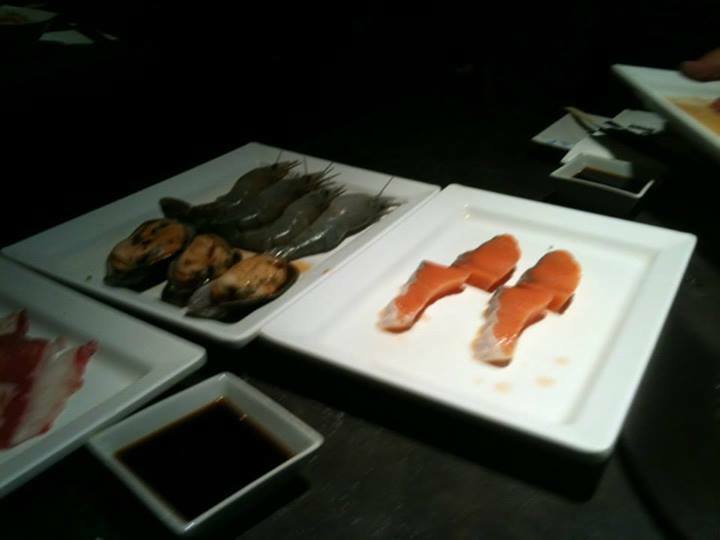 The experience was something new to me, but nevertheless I had a really full stomach after. Enter day 2 of the Grand Prix. My task for this day was different, as with other Grand Prix. I was assigned to logistics team, a team in which I’m very familiar with. My job for this day, is to setup the draft tables (including setting up the product), setup the playing area, setup the land station (to which players will get their basic lands for deck construction), and setup the top 8 table matches for later. It’s more like physical labor, which I’m already used to. Not much explanation to be said here, as you already get the idea. 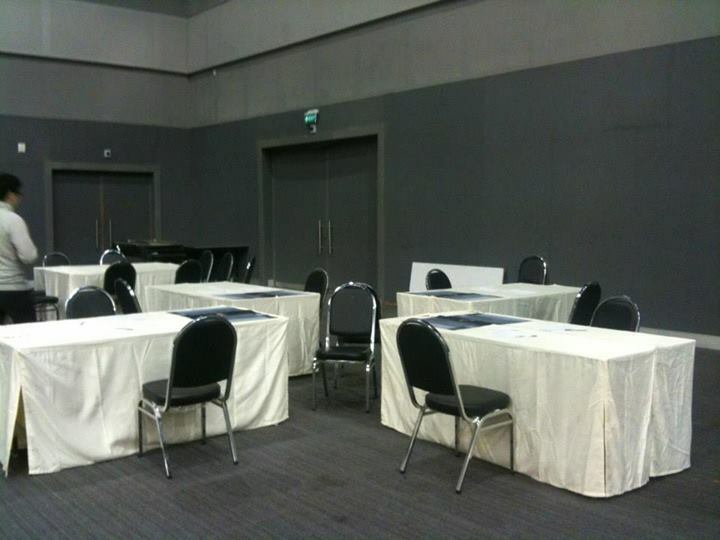 This is the area where the top 8 players will draft. Note that the extra chair is for the coverage team. 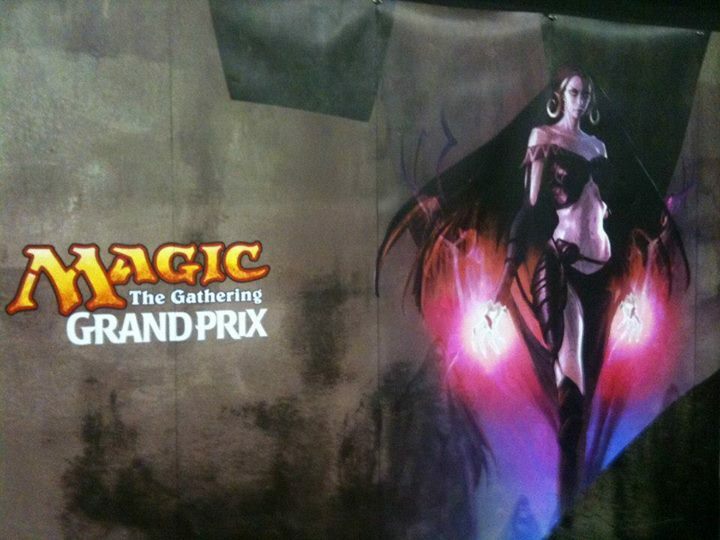 This is the area where the top 8 will slug it out. Again, the extra chair in the middle is for the coverage team. This area is unexpected. Turns out that my teammate Umesaki-san had the idea to do a barricade for the spectators. While we moved tables, the idea of barricades turned out into a playing area! 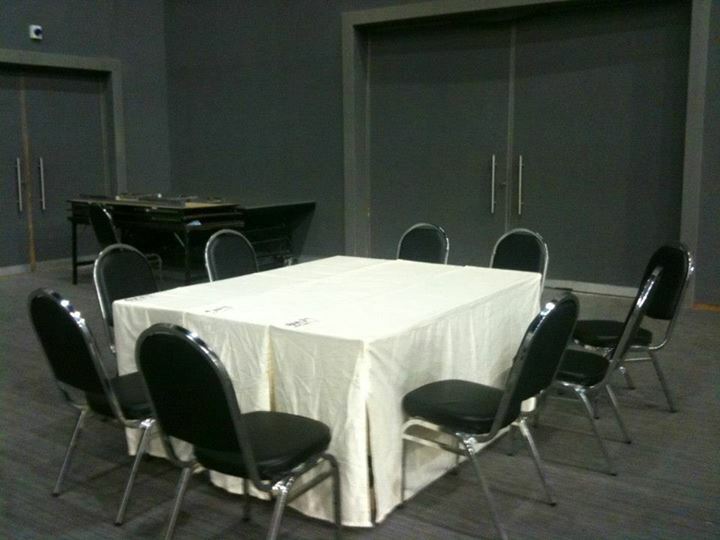 This area is first used by the top 8 players to build their draft decks into, with each player using one table. 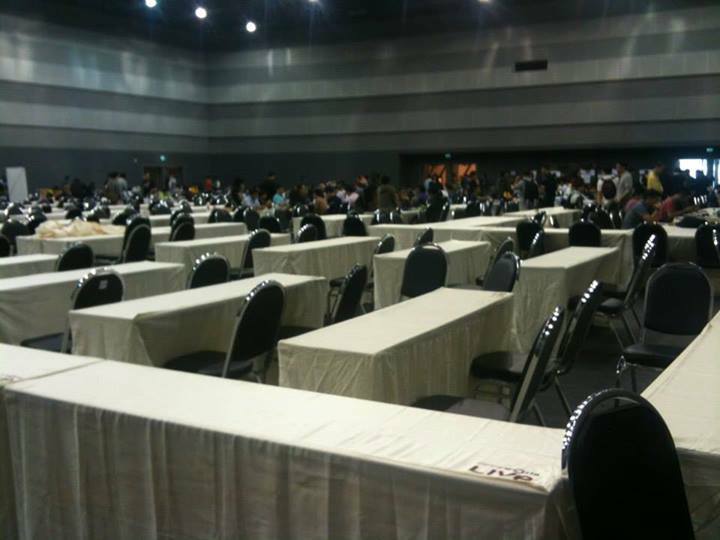 The second part was used by the public events people to play the much-awaited Modern Masters draft in this area. We dubbed the area, “The Dragon’s Maze”. Fitting for the setting of the event, as dubbed by coverage guy Chapman Sim. I didn’t finished the entire event, as I took off early after we setup the area for top 8. But looking at the coverage, looks like a local player won the entire tournament. 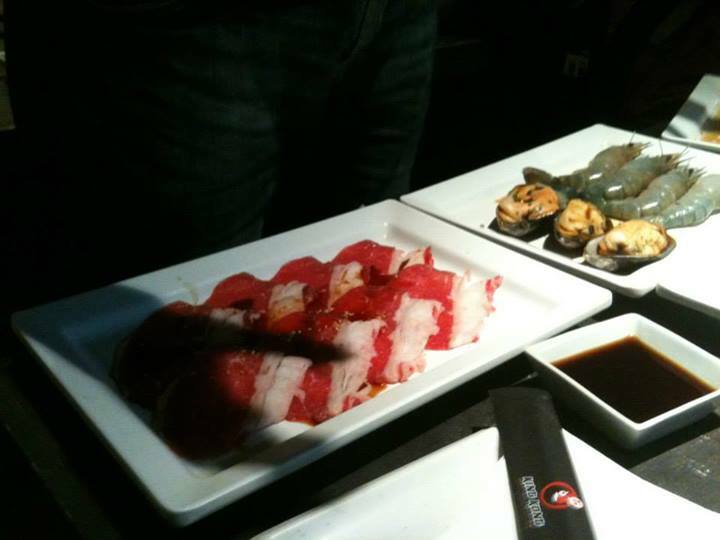 We were treated to a judge draft, with the leftover draft product used for this simple get-together occasion. 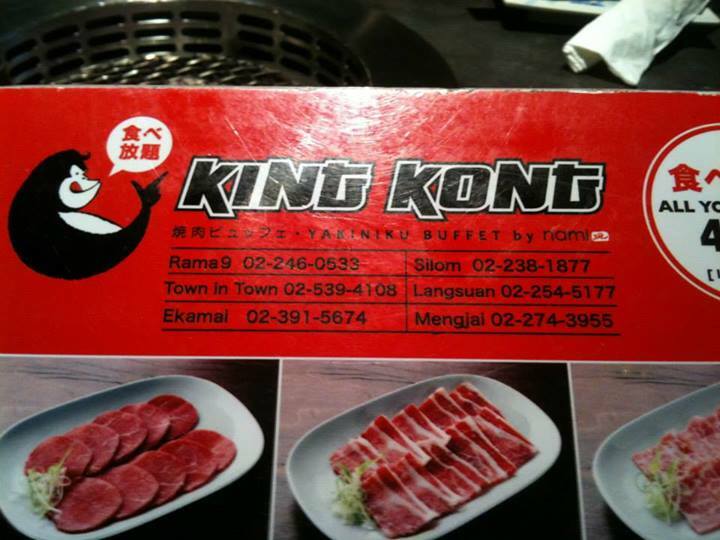 I didn’t get much to explore Bangkok due to my flight schedule, but I really enjoyed my stay here. When I get to return to Bangkok, I’ll make sure to explore the entire city (given that I am granted enough time to do so). 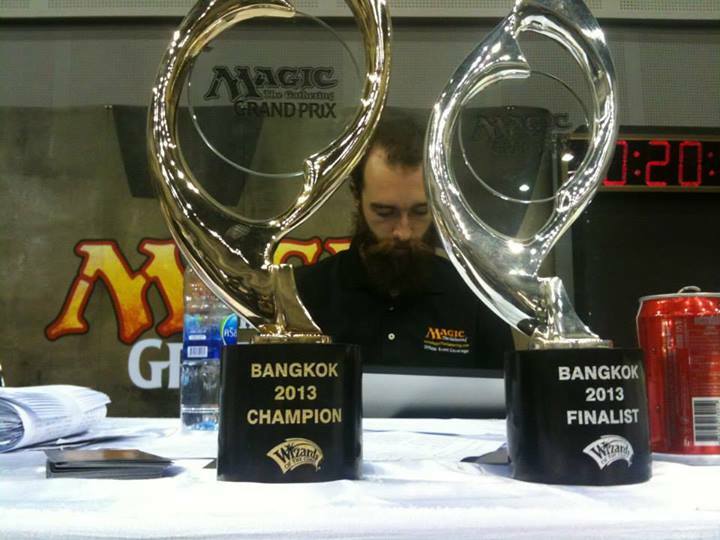 So for now, that ends my GP Bangkok 2013 experience. I’ll post another of this series sometime, perhaps after GP Hong Kong (I’ll be there for sure! ).